The Bulle rifleman MOLLE rig in tan is a mid-weight chest rig based vest incorporating storage for 8 M4 NATO, 4 G36 or 4 AK magazines in the front, together with a medical kit pouch and a utility or spare ammo pouch. The chest plate area can double as document storage and panel for an admin panel, but can be stowed away if not required. The chest rig can be worn with the shoulder straps crossed at the back, or extended with a velcro extension strap for wear over armour. 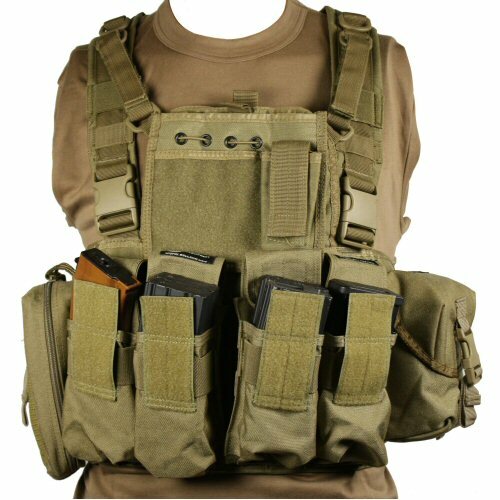 The vest can be quick released with side release clips on shoulders and back strap. Pouches included are: admin panel, 2 double rifle mag pouches, zip up medical kit pouch and utility or spare ammo pouch. The pouches can be detached and moved around as they are all compatible with any 25mm MOLLE system, as is the rig. The zip up medical kit pouch is a real bonus for carrying items that need to be secured and kept clean. The rig provides plenty of storage for medium-length gaming in a low to medium profile set-up. All buckles and clasps are from Duraflex's military specification Stealth warrior range, rig and pouches are made from 1000D PU coated Cordura. Suitable for small (without back extension) to xxl sizes (with back extension).